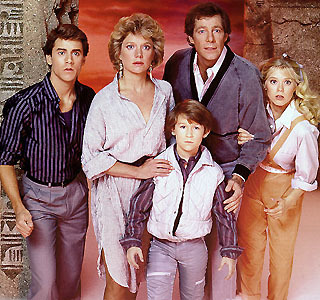 Otherworld was an American Science Fiction series that aired for only eight episodes from January 26 to March 16, 1985 on CBS. It was created by Roderick Taylor (Witchblade, Super Force, Open Graves) who appeared in each episode in a cameo as well as acting as show narrator. The series begins with the Sterling family on holiday visiting the Great Pyramid of Giza in Egypt. It turns out that after ignoring their money grabbing guide they get lost and walk into an area of the pyramid that is experiencing a once in ten thousand years celestial event, due to the planets aligning in a certain way. This event transports the Sterling family to another world named Thel which is hinted as being a parallel version of our Earth. Thel is inhabited by humans but has no countries or states, instead it is split up into Zones. Each Zone has its own government and way of life. The Sterling Family seem to hit a new zone each week and struggle to adapt to it. The Zone known as Imar is the central zone or capital city of Thel. Most of Thel’s history is not revealed, although the pilot episode contains references to ‘territories’, android creators, and ‘wars of unification’. It is thus unknown whether Thel is an alternate universe version of Earth, or another planet entirely. Travel between zones is strictly regulated to the point that no one can travel outside their home zone province (save for the Zone troopers), and all maps have been banned by the state. Thus, the inhabitants of each zone know absolutely nothing about life in other areas. The Sterling family c did not know about the travel ban, and approached a soldier in all innocence, seeking help, while the soldier – Commander Nuveen Kroll, reputed to be the worst and most ill-tempered of all Zone Troopers – viewed them as lawbreakers and treated them as such. When Hal insists they need help, Kroll attempts to arrest them and gets rough with Smith, the youngest of the Sterling sons. The Sterling Family resist and, in the struggle, Kroll’s sidearm weapon goes off, the blast rendering him unconscious. The Sterling Family take his access crystal (which is possessed only by Zone Trooper officers, and which gives them security access to state-controlled equipment and information data banks), his vehicle and his sidearm and drive away. For the rest of the series, Kroll is resolute in his attempts to recover his crystal, capture the Sterling Family (whom, in a report to his superior, he would later regard as a band of “armed terrorists”) and subject them to severe punishment. The Sterling family’s first night on Thel was spent in a province called Sarlax. This province is an ages-old mining colony where sophisticated androids laboured at mining a radioactive mineral named “sarlax”. The mineral is just radioactive enough to make humans sick which necessitates the android labour force. The androids are sophisticated enough to have created a culture of their own and are related to the once ancient robots that ruled Thel in the past. It is here that a friendly android couple gives the Sterling Family a historical book called “The Book of Imar” which chronicles the history of not just the planet but the androids and the culture of Thel. The Church of Artificial Intelligence is the official state religion of Thel, and no conflicting ideologies are permitted. Very few actual details about this religion are known, except that it appears to be centred on the worship of robots, computers and cybernetic technology (adherents are, in one episode, said to use “worship modules” which are electronic in nature). There is mention in the first episode of a race of humans that created primitive robots and then died out. Eventually the robots became bored and evolved themselves through continued upgrades and modifications until they created what is known as a plasmoid being: an android that was a biomechanical equivalent of a true human in almost every aspect. These plasmoids were so in love with their creators that they even built lifespans into their being so that they would be able to emulate death much like their onetime human masters. Eventually they began the process of recreating humans by a process that is not explained but once again Thel was populated by a majority of human lifeforms. A series of Egyptian-like stone markers (obelisks), each with one eye, are supposed to mark the way to Imar, a city with beautiful buildings and a suspension bridge (the city shown in the opening credits, apparently intended to be Imar, is a photographic negative of New York City). As previously mentioned, each episode had the family dealing with the bizarre ways of life in each “zone”, and at the end of the episode, fleeing one zone for another, pursued by Commander Kroll and his Zone Troopers. Kroll is intent on revenge, given that the Sterling Family stole his high security access crystal, acquired during their disastrous encounter in the first episode. References to Egyptian mythology abound, particularly in the signposts which the Sterling Family use to attempt to find Imar; it was implied that the ancient Egyptians either had the ability to travel between universes, or had contact with a people that did. 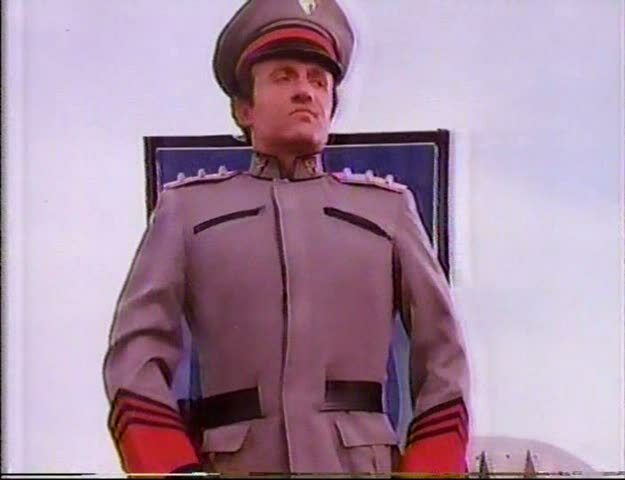 The episode “Village of the Motorpigs” featured a retired Zone Trooper who shows the Sterling Family a United States dollar stating his grandfather came from Earth. It was also said that those that travelled from Thel to Earth used the pyramid and all-seeing eye as a form of hidden message about the gateway to Thel. Another episode (“Princess Metra”) takes place in a zone called Metraplex. The zone’s former leader, Kelly Bradford (since deceased), came from Earth; on seeing Gina, who resembles Bradford and wears a similar necklace made of an American half-dollar, the leaders of Metraplex believe that Gina is Bradford and has returned. Before the power-hungry administrator allows Gina’s (re)instatement as leader, she is quizzed on Earth historical events by a computer – the quiz having been written by Bradford. In this episode, we learn that time passes at a different rate on Thel and Earth; Kelly is from Earth of the 1960s, yet her time on Thel was over 200 years ago. As mentioned, Imar appears to be the alternate universe’s version of New York City, an image of which is used in the opening credits of the show to depict Imar. Now fugitives in another dimension, the Sterling Family try to settle into their new home; but they soon find out all of the townspeople are androids. Trace, not knowing everyone is an android, falls in love with a young girl android named Nova. Nova must help the Sterling Family escape into the Forbidden Zone before the Zone Troopers capture them. She also must decide whether to escape with the Sterling Family, leaving her family behind, or let the one she loves go on without her. Amanda Wyss (Nova), Gokul (Ahmed), James Costy (Professor Kroyd), Conrad Bachmann (Litten), Michael Rider (Officer), Michael Sharrett (Stock Clerk), Frank Birney (Mr. Milton), Gary Pagett (Monitor), Barbara Beckley (Mrs. Mob), Anita Jesse (Miss Wanda), Dan Lewk (Fabrique), Janet Rasak (Woman), Robert Vinson (Student), Zachary Baker (Bo), Ray Walston (Gad-Ben Sirrah (photo only), Peter Bromilow (Praetor), Wayne Alexander (Lieutenant), Rodger LaRue (Corporal), Brandon Crane (Smith Sterling). The Sterling Family settle into a new agricultural town called Tarka. For their safety they use the crystal they stole from Commander Kroll to change their names to the Hardins. After Trace’s grades drop in school, he gets a yellow slip – meaning he is drafted into the Zone Troopers. Trace learns that being a Zone Trooper is for life unless he becomes an officer. After the Sterling Family are shipwrecked on an island, they find a paradise resort. What nobody knows is that the resort is a cover for using its guests to make a youth sustaining liquid called Koloma. But, June and the kids must save Hal, when Scarla, the director of the resort, tries to seduce him and use him in the liquid making process. Now living in Centrex City, Trace and Gina participate in a talent contest at school where they play a “new” form of music called Rock and Roll. They are seen by an agent scouting new talent who then makes them famous. The religious organization called the C.A.I. (Church of Artificial Intelligence) sees them as rebellious icons and fights to quiet them by contacting Praetor for help. Praetor, not wanting to be bothered by something so insignificant, sends Kroll. While wandering in the Seplicer Mountains deep in the Forbidden Zone, the Sterling Family are captured by a wild group called the Motorpigs. Hal must challenge the leader to a motor duel in order to escape. When the Sterling Family arrive in a town called Ador, they find a society where the women are dominant and the men are treated as second class. While traveling through the dead forest of Animula, the Sterling Family encounter a half man-half beast, named Virago, with incredible powers. Virago takes June to be his companion. Assisted by another forest resident named Akin, Hal and the kids try to rescue her. After arriving at a province called Metraplex, Gina is mistaken for a returning historical figure called Princess Metra. Seeing that groups of people called Microworkers are used as slave labor by the Macrolites, Gina takes advantage of her status by changing the laws to bing about change; and ultimately gets help from a group of rebelling Microworkers. However, the current leader, called the Prime Manager, does not give up her power willingly. Guest star: Carolyn Seymour (Prime Manager), Hunt Block (Cort? ), Byron Morrow (Cabinet Secretary Magnon? ), Joan Foley (Britina), Drake Hogestyn (Captain Valdor), Kristi Somers (Princess Metra / Kelly Bradford), Douglas Alan Shanklin (First Technician), Ellen Crawford (Head Supervisor), Charles Walker (Lieutenant), Robin Klein (First Girl), Will Nye (Man #2), Larry Cedar (Man #1), Tom Harrison (Sector Chief), Ted Richards (Officer #1), David Lloyd Nelson (Peace Guard), GiGi Vogan (Girl #2), Philip Simone (Zal), Marneen Fields (Woman Microworker), Alex Daniels (Officer #2), Nora Masterson (First Servant), Daniel McVicar (First Guard), Mark Burke (Lieutenant), Christopher Walker (Small Boy), Kathy Spitz (Girl #1).